Ductless HVAC systems are fantastic solutions when you need to heat or cool spaces quietly and independently. 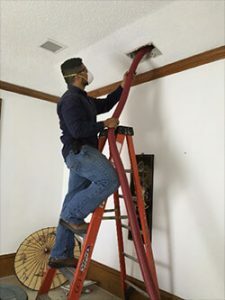 They’re called “ductless” because, instead of transporting air around your home via air ducts, they consist of a wall blower directly connected to an outdoor unit. Generally, ductless systems are favored because each unit is independent of the others. Efficiency, comfort, and versatility all make these systems great options. However, without maintenance and repairs, the systems can’t deliver full benefits. Ductless systems need to be able to turn on a dime. Additionally, if one goes down, an entire living/business space can end up marooned in the heat. Don’t let this happen! The Frontier A/C can quickly get troubled units blowing again. We are also proud to offer maintenance services that allow us to prevent systems from having trouble in the first place. Your HVAC system plays an integral role in the comfort and health of everyone in your home. The Frontier A/C team is proud to be your ally when it comes to keeping that system up and running all year long. Contact us in southern Texas to learn more about what we offer.